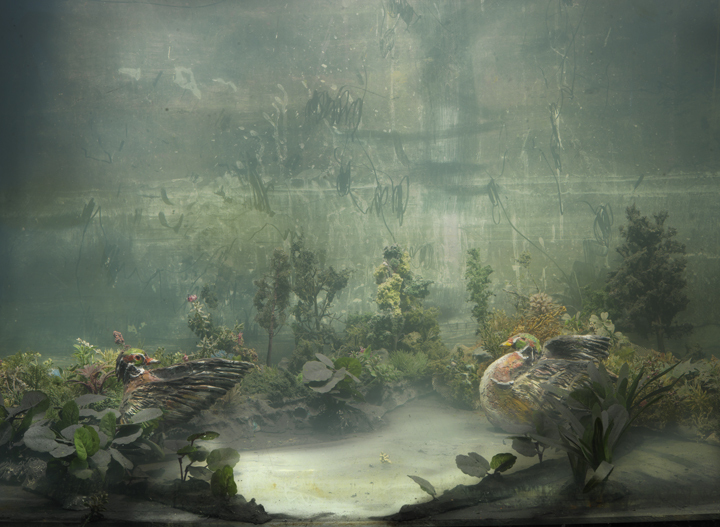 What makes these dioramas unusual is that they are created in a 200 gallon tank filled with water. Though I sometimes build a scene in front of and behind the tank, most of the “action” takes place in the tank with paint injected into the water for cloud formations. I use whatever materials I can find on the street, in stores and on the internet that might add to a perception of reality that is not quite what it seems. Among the “Landscapes” series there are some really moody and inspiring staged set images. Congratulations for all the hard work and imagination. I am in love with this. Buying one of your works now is one point on my life’s bucket list. I like this!! I don’t have a 200 gallon but have a 125 gallon, 72″ about how much $$?? Pingback: Las 5 portadas de discos con más arte de 2015 | Va de arte! Are all glorious, inspiring and powerful.